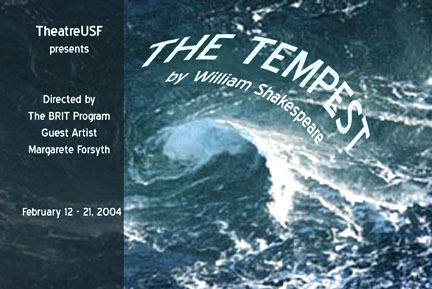 We present an archive of past Theatre & Dance productions that took place on the USF Tampa campus. Click on the Event Posters below to see photos from the productions. Funding for this musical was made possible in part through the generous support of the John W. Holloway Endowed Chair in Dance and Theatre. 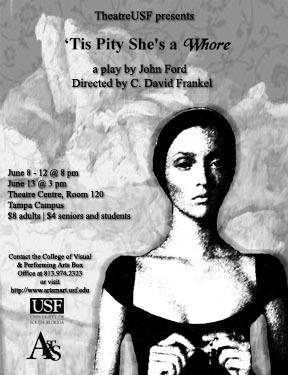 This production of 9 Parts of Desire is a THISBridge Program project - a collaboration between Art2Action and the USF School of Theatre and Dance. The Guest Artist work of Alonzo King and Robert Moses was made possible though the generous support of the Holloway Endowed Chair in Dance and Theatre. The Guest Artist work of Maurice Causey and Patrick Damon Rago was made possible though the generous support of the Holloway Endowed Chair in Dance and Theatre. The Guest Artist work of Donna Mejia was made as a part of the THIS Bridge Program, a collaboration between Art2Action and the USF School of Theatre and Dance. Featuring: guest choreographer Jennifer Archibald and Fokine's "Les Sylphides"
Sound Design: John Martinez, Jr.
A real yet strange play that seems to tell itself through many different stories like a many-sided coin that keeps changing its face. It is a fairy tale of itself, flipping back and forth between an outer focus and an inner focus of the realities of the world of the play and of the world of the actor. The words scratch and claw to a surface sometimes finding gentleness. And.. the demon in me is the demon in me. 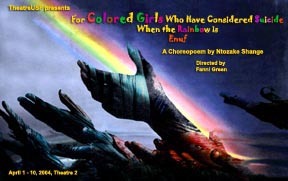 Student productions included Franz Xavier Kroetz's Michi's Blood and Friedericke Roth's Piano Play. And Harald Mueller's Flotsam and Jetsam.